The Sinn U2 Black is constructed from the same steel that is used on the outer hull of submarines. The steel was procured by Sinn from a steel supplier to Emden GmbH, one of Germanys North Sea shipbuilding yards who construct submarines from the very same steel. The technology and design elements used to create the Sinn U2 Black go far beyond standards used at most watch companies. Verified Owner Comments: Love this watch. It has he right ergonomics. I prefer this over my Sea Dweller which cost twice as much. "Serious piece of watch gear!" "Toughest Watch I Have Owned!" Verified Owner Comments: I have had this watch for a couple of weeks now and have already rated it once. It's a stunning piece and very well made. I wear it everyday and am VERY happy with it. I felt compelled to add another review because of a recent incident with the watch. I am always careful with my watches but a couple of days ago, while opening a door, I struck the watch crystal and bezel against a metal door knob. It was a hard impact and I was not happy with myself. When I inspected the watch, there wasn't a single mark on it. Truly an amazing piece and very tough. Thanks again to Sinn for creating such an amazing time piece. And I will be back to WatchBuys! 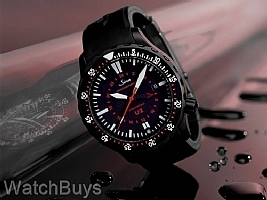 "Sinn U2 Black EZM 5! Tough Watch!" Verified Owner Comments: I just received my Sinn U2 Black EZM 5 and am VERY pleased with it. Sinn quality and craftsmanship are first rate. The watch has a great appearance and is very comfortable to wear. The people at WatchBuys are great and very helpful! I highly recommend this watch and WatchBuys. "German watchmaking at it's best"
Verified Owner Comments: Great timepiece for the money. Solid steel case able to withstand strong impacts. Recently ran a marathon with it without any problems. Keeps time with great accuracy. Dial is nice with combination of red and white. Highly recommended for those with an active lifestyle. Verified Owner Comments: As a child, I grew up wearing Swiss Army watches. Now that I'm an adult I've gotten a man's version; the Sinn U2 S.
It has taken the Swiss Army watch idea but put serious technology into it, tegimented anti-magnetic U-boat steel toughness, Ar inert gas and copper sulphate moisture prevention to prolong time between servicing, 2000m depth rating, 44mm diameter and 15.5mm thick, this is one big tough tool watch that has yet to be topped. It is very comfortable to wear and is extremely understated in its abilities. Verified Owner Comments: Tremendous timepiece. My job in the military has me in and out of birds, in and out of MRAPs/Strykers, and generally living in dust. Given these conditions, this watch holds up remarkably well. Additionally, it's attractive as well as low-profile. The second timezone function is well done, however it won't help you in Afghanistan (which is half an hour off from the rest of the world...though that's more Afghanistan's fault than Sinn's). To give you an idea of the toughness and functionality of this watch, it's replaced my Suunto in the field. Good work by Watchbuys for shipping APO and otherwise providing outstanding service. The WatchBuys team have been nothing but a pleasure to deal with! "Tough as Nails and Looks Fantastic!" Verified Owner Comments: I have worn this watch nonstop since receiving it in Oct 2008. This watch wears comfortably all day and looks great with any attire. I have knocked this watch on door knobs, the metal frame of my recliner and against my truck door (multiple times) and it shows no wear at all. Not a scratch!! I have saved my nicer watches (Ulysse Nardin and Jaeger LeCoultre) for suits. This Sinn is an excellent buy. Thanks to the guys at Sinn for making such a tough watch that looks great as well. "U2 S EZM 5 Lives Up to the Hype!" I just received my U2 S EZM and I am blown away by the attention to detail that Sinn put into this watch. The technology is top notch and the execution of it lets you know that Sinn is a serious watch company. The guys at WatchBuys are top notch as well.